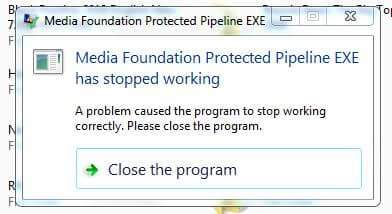 This problem occurs when ”Media Foundation Protected Pipeline EXE has stopped working” error message is displayed by Windows whenever you try to transfer video files from your PC/laptop to your mobile device. Sometimes this error message is also shown when you are playing a video or song online in a web browser or offline using Windows Media Player. The video file format can be any popular format such as MKV, WMV, FLV, AVI, MP4, MPEG, etc. The “mfpmp.exe“ or ”mf.dll” files present in ”C:\Windows\System32“ folder are corrupt. A plug-in installed in Windows Media Player is incompatible and causing this issue. 1. Open Windows Media Player from Start Menu. Alternatively you can direct launch it using wmplayer.exe command in RUN dialog box. 2. Now press ALT key to show menu bar and select Tools -> Options. 4. If you find any plug-in installed (such as DFX audio enhancement, SSMS audio filter, etc) under these categories, disable/remove it. Now try to copy videos from your computer to your mobile or try to play the problematic video and it should work fine. If above mentioned solution doesn't work for you, you can try to delete mfpmp.exe and mf.dll files which are responsible for “Media Foundation Protected Pipeline“. Renaming the files will also do the job. 1. Open My Computer or This PC and go to C:\Windows\System32 folder. Alternatively you can direct open ”System32“ folder using system32 command in RUN dialog box. 3. To rename or delete these files, you'll need to take ownership of these files as these files are protected by Windows. 4. After taking ownership, right-click on each file and select Rename option one by one. Change their names to any other desired name for example mfpmp_bak.exe and mf_bak.dll respectively. PS: If you find any difficulty while renaming mfpmp.exe file such as file is in use, open Task Manager and end task of mfpmp.exe service. Now you'll be able to rename the file. That's it. After renaming the files, you should be able to play videos in WMP or transfer videos to your mobile device without any problem. When you attach the device to your computer using USB cable, select ”Mass Storage” option from USB settings in your mobile phone. It should also fix the issue.